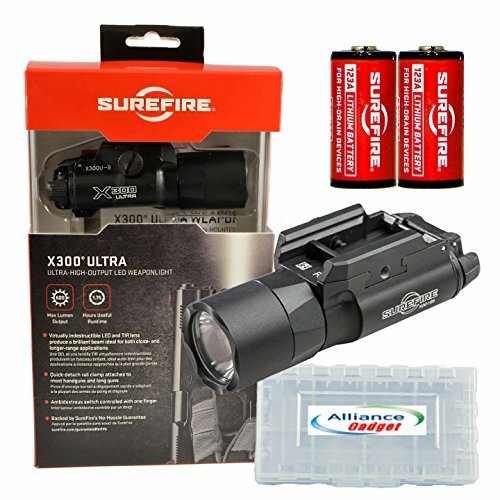 The powerful, virtually indestructible X300 Ultra WeaponLight was designed for handguns but is also excellent for long guns and mounts securely to MIL-STD 1913 rail-equipped rifles via its enhanced T-slot mounting system. This WeaponLight features a high-performance LED that generates 600 lumens of stunning white light that's focused by a Total Internal Reflection (TIR) lens to produce a high-intensity beam with extended range yet provides significant surround light for peripheral vision in close quarters. The highly efficient LED generates tactical-level light-ideal for close- to long-range target identification-for 1.75 hours per set of batteries.